National Bookmobile Day is Wednesday, April 10! On this day we celebrate our nation's bookmobiles and the dedicated staff who provide valuable and essential services to their communities. 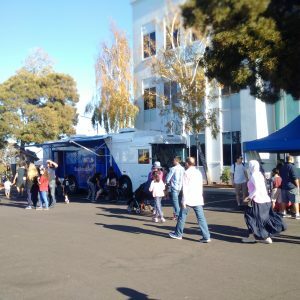 As a way to celebrate San Mateo County Libraries Bookmobile, I thought I'd walk you through a typical day in the life of the Bookmobile and its staff. The morning starts off by greeting the Bookmobile at its home, the San Mateo County Libraries administration building. It rests overnight in its designated parking spot at the side of the building, where it is plugged to charge the batteries. The batteries power the outlets that run the computers, lights, WiFi, and heater/air conditioner inside the bus. The Bookmobile is stocked with books, DVDs, audiobooks on CD, board games, laptops and WiFi hotspots, GoPro cameras, ukuleles, and energy and water-saving toolkits. Every morning, staff check-in returned materials from the previous day and restock the bus. All of this is needs to done before the driver and I step foot onto the bus to start the day’s adventure. Once the batteries are fully charged and the bus is fully stocked, the driver does a safety check to ensure the bus can operate safely. We secure everything that can move out of place or topple over during the drive. After the final touches of our preparation is complete, I sit in the passenger seat and let the Bookmobile driver do their magic! View of Highway 1 from the passenger seat. 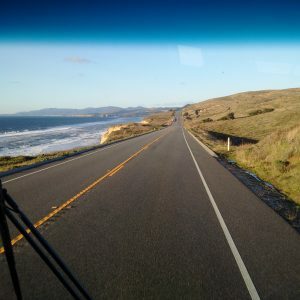 A lot of our regular stops require driving through California’s Highway 1, a road known for its scenic landscape and perfect views of the state’s natural land, air, and ocean. A typical day consists of seeing sunshine glistening on the Pacific Ocean to the west, glorious mountain ranges to the east, bright blue sky with floating clouds rolling by on the horizon, and a clear road ahead. Upon arriving at a stop, the Bookmobile driver and I immediately set up the check-out stations located in the front and back of the bus. We open our doors and greet our patrons - most of them have been using the Bookmobile for years and have a special relationship with the bus and staff. Some patrons chat with fellow patrons visiting the bus, while others return materials, and look at our selection for new things to borrow. Parents bring their children to play with the interactive toys inside and read picture books to them in seating areas within the bus. The hustle and bustle of activity ends when we close up shop and prepare to move to the next stop. The Bookmobile attracting a crowd. The Bookmobile’s day usually ends after sunset. The bus driver and I take the Bookmobile back to its designated parking spot at the administration building. Once the bus driver and I exit the Bookmobile, we connect the bus to the power outlet to replenish the batteries. Once again we leave the Bookmobile overnight to rest for a new adventure the next day. The Bookmobile driver and I work long days on the road, but seeing the community enter the bus and use our services makes everything worthwhile. I have seen patrons wait for the Bookmobile’s arrival, and I know our library users schedule their personal lives around the Bookmobile’s stops. To our patrons, please know that the Bookmobile crew appreciates your presence and kindness in our lives. Thank you and see you at the next stop! 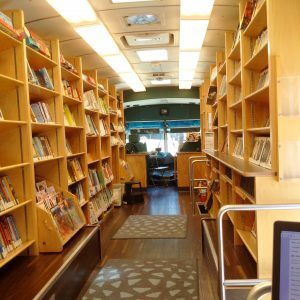 Have you had an experience on the Bookmobile? Share with us below!